For simulation and signal integrity checks for high speed PCB design analysis, use OrCAD software with intuitive PCB design & layout tools. Leading companies from around the world in every industry are using OrCAD to solve today’s complex engineering problems every day. done in less time and right the first time. The Allegro engine powers OrCAD and your productivity. PCB layout and high-speed routing are no match for your skills, and a little real-time electronic design feedback from the tool. 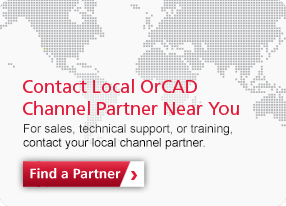 With OrCAD, you can produce a manufacturable board design faster. Even the most complex routing is easy with real-time constraint-driven feedback tips to help you make a manufacturable and functional PCB. Dynamically update shapes instantly without waiting to repour polygons when you resize, reshape, and plow through shapes when routing. The repetitive nature of BGA and other high pin-count device fanounts is perfect for time saving automation to make you more productive. Analyze and verify your analog and mixed-signal electrical circuits with the advanced PSpice simulation tools in OrCAD. OrCAD PSpice finds real, commercially available parts for your component variables and analyzes your entire circuit to model expected current, voltage, power and temperature condition for every component and compares those results to component limitations to give you an ordered list of critical components in your design, so you know which components to invest in tighter tolerances, and which you can save costs on. Download the latest version of OrCAD–Powered by: OrCAD Capture, PSpice Simulation, Sigrity Analysis, and Allegro Layout–now, and try it for yourself. See how OrCAD can help you boost your creativity, productivity, and plain old getting things done.